In a city grappling with an affordability crisis, thousands of hopeful tenants apply for a limited number of subsidized apartments. But some developers are having trouble finding tenants to fill these spots, specifically those reserved for higher-income residents. A particularly hard slot to fill is reserved for people who earn 130 percent of the area median income (AMI) or higher — which in New York City is $86,840 for an individual. According to some, the problem lies in both the marketing of these units and how the city handles awarding these apartments. And more units seeking higher-income tenants could be on the way. Under the new 421a, dubbed Affordable New York, some developers have the option to set aside up to 30 percent of units for tenants making 130 percent AMI. The Durst Organization‘s EŌS, a 375-unit rental building at West 31st Street and Sixth Avenue, has 19 apartments set aside for tenants that fall in that higher-income bracket. The lottery for those units is set to launch in the coming weeks, but Barowitz said he doesn’t expect much trouble finding applicants since there aren’t that many apartments available. Instead, he said the problem becomes more pronounced when a project has a higher volume of units available at higher-income levels. One industry source with experience building and marketing mixed-income housing agreed, adding that an overwhelming amount of paperwork and the months-long wait between applying for a unit and actually moving in can be a deterrent for tenants in higher-income bands. “We’re always working to improve our marketing efforts to ensure families of different income levels are aware of the housing opportunities available to them through our Housing Connect system,” she said. There’s also the added frustration of a tenant applying for an apartment in one rent range but being offered another for a higher price. This occurs because certain income bands overlap. 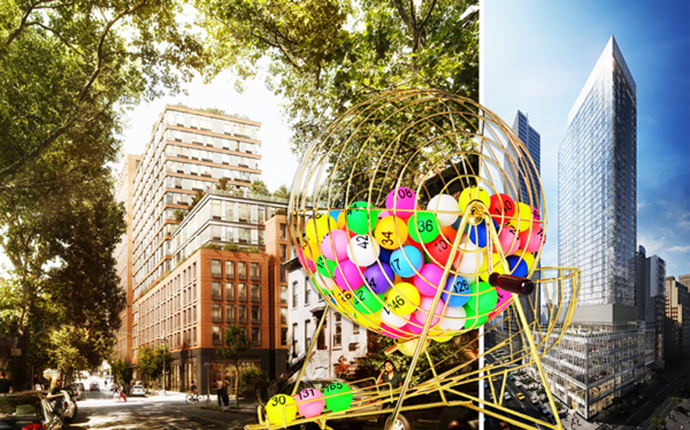 For instance, at 221 West 29th Street, a new 70-unit building that launched its lottery last month, a single person who makes between $85,338 and $86,840 qualifies for both a studio apartment that charges $2,123 per month and another that asks $2,432. So the individual may apply for the cheaper unit, but end up being offered the more expensive one. The same problem exists at Greenland Forest City Partner’s 535 Carlton Avenue in Pacific Park, where a studio that rents for $1,729 month requires a tenant who earns between $60,618 and $92,075, while a $2,137-per-month studio requires a resident who makes between $74,606 and $104,775. That’s a $408 difference. Greenland Forest City wound up posting units on StreetEasy because not enough lottery winners would take units reserved for tenants making 135 to 165 percent AMI, as reported by City Limits and DNAinfo. Ashley Cotton, executive vice president of external affairs at Forest City New York, said there’s a need to educate the public about the availability of these higher-income units. She noted that Forest City uses targeted Facebook and Instagram ads to find prospective tenants who would qualify for such apartments at 535 Carlton. The company has also chosen to refer to the units as “rent stabilized,” as well as “affordable” since people aren’t aware that “affordable housing” is available to them.